The beauty of a saree draped is never complete without an artfully designed blouse. Indian women know the significance of a well-matched blouse and hence opt for a suitable one from a variety of models. No matter what design is selected, the salient feature will be the theme that matches the saree. The use of embroidery on the blouse is as much a popular trend as it is on designer sarees and other Indian attires. Among the designer blouses online presented by HLabel, the Nazakat ethnic blouses are particularly fascinating for their embroidery and prints that add the element of well-placed embellishment that creates a well-balanced glam to the get-up. As the name suggests, bringing the elegance factor into the attire through well-applied artistry and wonderfully selected colours is the speciality of the collection. In the array of designer saree blouses, these ethnic blouses make the perfect match for their respectively suited sarees, from the same collection or others. Change the simplicity of a pleated skirt by pairing it up with this green viscose raw silk blouse with block print. It is best to be complimented with stylish statement earrings. Enter the festive arena and delight them all with your charming elegance. Do you wish to embrace the gaudy look, for a break from the simplistic look? Wear this yellow viscose raw silk blouse with block print and embroidery on the neckline. It’s a good one to choose if you are wearing it with a plain skirt or a crepe saree. Add to the party glee with grandeur. 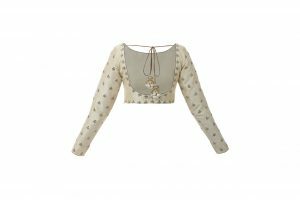 Take your casual look to another level by wearing this beige colour raw silk blouse with Kundan embroidery. The beauty of stones studded on the embroidery makes the blouse highly attractive. It goes elegantly with a skirt or a plain saree. Turn a simple plain saree or a skirt into a style statement by pairing it up with this green raw silk blouse and net sleeves. If green is your favourite colour or the best match for your main drape, this is a great pick. For added style, wear it with a pendant set and Kundan flats. TheHLabel has the best variety in ethnic, Western and fusion wear. Reach out to us online. We offer you exclusive designer wear that you can order in customized sizes, with selected features. Visit thehlabel.com to explore more.